A brief interlude from my report under the covers at Charing Cross Hospital to report on this convalescence’s recovery menu in recovery from illness as well as recovery from the NHS’ uninspiring menu. All home-made and garden-fresh where possible. Poultry Salad from chicken, chicory salad, apples and oranges. Pizza (served lukewarm for medial reasons), Pudim Flan. 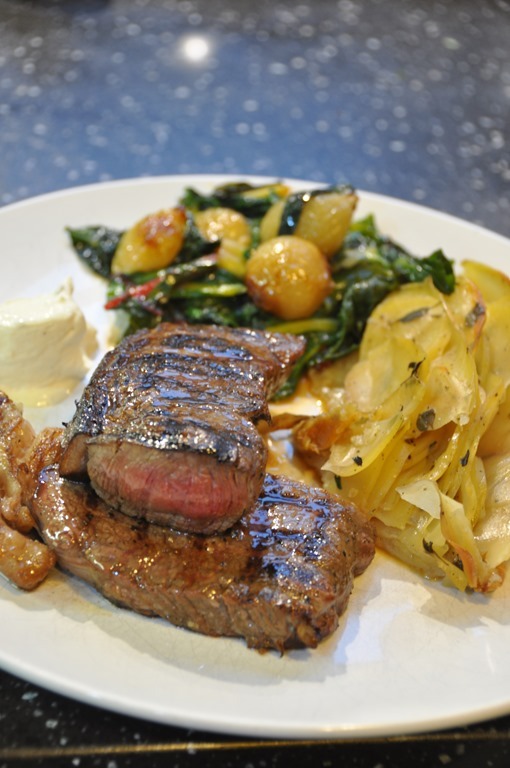 Hay-smoked Sirloin Steak with lemon thyme leaf potatoes, Swiss chard, Italian kale and caramelised onions (shown in picture). This entry was posted in Food and Drink, Thoughts and tagged food by w7. Bookmark the permalink.